ABSTRACT: Non-alcoholic steatohepatitis (NASH) is a metabolic disorder of the liver that may progress to fibrosis or cirrhosis. In the present study, we examined the possible preventive effect of an extract of Teucrium polium L. (Lamiaceae), a plant with high flavonoid content and antioxidant activity, on experimental NASH. To induce NASH, a methionine and choline deficient (MCD) diet was given to N-Mary rats for 8 weeks. Rats were given normal diet (control, n=5), normal diet plus crude extract of T. polium (TPC) (0.5 g/kg body weight/day by gavages) (C+TPC, n=5), MCD diet (MCD, n=5) and MCD diet+ TPC (0.5 g powder/kg body weight/day by gavages). Histopathological evaluation of the liver samples revealed that treatment with TPC has abated the severity of NASH among the MCD–fed rats. In addition, the hepatic malondialdehyde, caspases–3 and TNF-α levels were decreased among the same group of rats. The activities of liver superoxide dismutase, glutathione peroxidase and the level of hepatic glutathione were also enhanced among MCD+TPC group relative to MCD group. Moreover, the crude extract significantly enhanced the active form of Akt and the deactive form of JNK. Based on these data, it can be concluded that preventive effect of T. polium on NASH is mediated mainly through suppression of oxidative stress with consequent activation of Akt, a survival factor, and deactivation of JNK, an apoptotic factor, and this might be attributed to the strong antioxidant property of the crude extract. INTRODUCTION: Nonalcoholic steatohepatitis (NASH) refers to a stage of nonalcoholic fatty liver disease (NAFLD) which is characterized by diffused fatty infiltration, lobular inflammation, ballooning degeneration and fibrosis in the liver 1. The mechanism(s) that mediates the transition from steatosis to steatohepatitis remains unknown. Day and James proposed that the development of NASH involves two pathological hits: in the first hit, an initial metabolic disturbance leads to accumulation of free fatty acids and triglycerides within the liver (steatosis). The progression of steatosis to NASH is guided by other factors (second hit) such as extensive oxidative stress and proinflammatory cytokines 2. Moreover, oxidative stress and TNF-α have been considered as the major players in the incidence of apoptosis among NASH-affected hepatocytes 1,3. The high incidence of hepatocyte apoptosis have been linked to the severity of hepatic inflammation and fibrosis. In addition, the excess ROS leads to over expression of tumor necrosis factor-α (TNF-α) in hepatocytes, kupffer cells and adipose tissue 1. In the liver, TNF-α is involved in pathophysiology of liver diseases including viral hepatitis, alcoholic steatohepatitis and NASH 3, 4. Exposure to ROS has been shown to activate some of the signal transduction pathways involved in cell death of chronic liver diseases. Oxidative stress– induced c–jun N–terminal kinase (JNK) activation has been implicated in the development of NASH5. It is believed that the activated JNK leads to cell death through regulating the mitochondrial death machinery 6. Moreover, Akt kinase, a member of protein kinase B, functions as a critical cell survival factor and plays an important role in preventing hepatocyte injury induced by a variety of proapoptotic stimuli including ROS and TNF-α 7. Reduced activation of Akt has been shown in patient with simple steatosis and NASH 8, 9. Although, there is yet no effective drug therapy, the implication of oxidative stress in the etiology and progression of NASH has led to the suggestion that antioxidants can have health benefits as prophylactic agents. In that regard, several investigations have evaluated the protective effects of many synthetic and/or plant-derived antioxidants on the severity of NASH 10. Teucrium polium L. (Lamiaceae) is a medicinal plant used for various purposes such as anti-inflammatory, anti-bacterial, anti-hypertensive, anti-hyper-lipidaemia, and anti-hyperglycemia 11-13. The antioxidant activity of T. polium extract has been evaluated and published by several independent groups 14, 15. Moreover, it has been shown that the extract diminishes the oxidative stress in streptozotocin-induced diabetic rats and it attenuates the extent of lipid peroxidation in rat liver microsomes 15, 16. 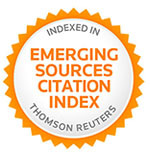 Our goal in this study was to investigate whether the crude extract of T. polium, with strong antioxidant activity and high polyphenolic content 14,15,17, is able to prevent the incidence of NASH via alternations of hepatic oxidative stress and cytokine levels among the experimental animal models and in that case, possiblemechanism(s) involved in both hepatocyte death and protection by TPC would become elucidated. Materials: Reduced glutathione (GSH) was obtained from Fluka (Buchs, Switzerland). Ethylene-diamine-tetra-acetic acid (EDTA) and bovine serum albumin (BSA) were obtained from Sigma–Aldrich Chemical Co. Ltd. (England). Trichloroacetic acid (TCA) was obtained from Sigma Chemical Co. (MO, USA). Nitroblue tetrazolium (NBT), 5, 5'-dithiobisnitro benzoic acid (DTNB), 5, 5-dithiobisnitro thiobarbituric acid (TBA), nicotinamide adenine dinucleotide reduced (NADH) and nicotinamide adenine dinucleotide phosphate reduced (NADPH) were obtained from Merck Co. (Germany). Sulphosalicylic acid was obtained from Carlo Erba (Milan, Italy). All primers and probes were obtained from Bioneer (Chungwon, Korea). All other chemicals used were analytical grade. Plant extract preparation: The aerial parts of T. polium L. were collected from Yasouj province, Iran on the middle of June in spring. A voucher herbarium specimen (No. 570) was deposited in the herbarium of the school of pharmacy, Shaheed Beheshti University of medical sciences, Tehran, Iran. The plant aerial parts were air-dried, protected from direct sunlight, and then powdered. The powdered plant material (300 g) was extracted three times with ethanol (EtOH 80%), at room temperature (RT) overnight. The EtOH extracts were combined and concentrated under reduced pressure on a rotary evaporator to dryness to give the crude residue. The residue was then dissolved in a fixed volume of distilled water (100 mg/ml) and kept at −20°C for further investigation. Animals and experimental protocols: Male N–Mary rats, weighing 175–220 g, were housed in cages with 12–h/12–h, light/dark cycle, and were allowed free access to food and water ad libitum. All procedures for animal experiment were in accordance with the animal ethics committee of University of Tehran. Animals were divided into 4 groups: group 1 (control, n=5) was fed a normal diet, group 2 (C+TPC, n=5) the rats received a normal diet along with TPC by gavages (equivalent to 0.5 g powder/kg body weight/day), group 3 (n=5) received a methionine and choline deficient (MCD) diet and group 4 (MCD+TPC, n=5) was fed a MCD diet with TPC equivalent to 0.5 g powder/kg body weight /day by gavages. The diet composition has been described previously 18. After 8 weeks, rats of all groups were fasted overnight and then sacrificed under diethyl ether anesthesia. Plasma and liver samples were snap–frozen in liquid nitrogen and kept at –80°C for biochemical and molecular examinations. Histopathological examination: A part of each fresh liver tissue was fixed in 10% formalin, and paraffin blocks were prepared. The sections from blocks were stained with hematoxylin–eosin (HE) and masson trichrome. The histopathological evaluations were performed blindly by an expert pathologist using a scoring system proposed by Kleiner et al 19: steatosis (0–3), lobular inflammatory changes (0–3) and hepatocyte ballooning (0-2). Fibrosis was evaluated as absent/present. Biochemical analyses: The plasma alanine aminotransferase (ALT) and aspartate aminotransferase (AST) were determined using enzymatic kits according to the manufacturer’s instructions (Pars Azmun Co., Tehran, Iran). The sera level of triglycerides (TG) was determined using enzymatic kits (Pars Azmun, Iran) according to the manufacturer's instructions. Preparation of liver homogenate: The liver samples were cut into small pieces and homogenized in Tris-HCl buffer (25 mM, pH 7.5) with a homogenizer to give a 10% (w/v) liver homogenate. The homogenates were then centrifuged at 12,000 rpm for 15 min at 4°C. The protein concentration of each extract was determined by the method of Lowry 20 using BSA as the standard. The supernatant aliquots were stored at -70°C until use. Lipid peroxidation assay: The assay of liver malondialdehyde (MDA) level, as an index of lipid peroxidation, was performed as previously described 21. Briefly, 2.5 ml of TCA solution (10%) was added to 0.5 ml of each liver homogenate followed by heating in a boiling water bath for 15 min. After cooling to room temperature, the samples were centrifuged at 3000 rpm for 10 min, and then 2 ml of the reaction mixture was transferred to a test tube containing 1 ml of TBA solution (0.67%). Each tube was then placed in a boiling water bath for 15 min. After cooling to room temperature, the absorbance was measured at 532 nm. The concentration of MDA was calculated based on the absorbance coefficient of the TBA–MDA complex (ε=1.56 ×105cm–1M–1) and it was expressed as nanomoles MDA per milligram of protein (nmol/mg protein). Superoxide dismutase activity assay: Superoxide dismutase (SOD) activity was measured based on the extent inhibition of amino blue tetrazolium formazan formation in the reaction mixture of NADH, phenazine methosulphate and NBT, according to method of Kakkar et al 22. The assay mixture contained 0.1 ml of liver supernatant, 1.2 ml of sodium pyrophosphate buffer (pH 8.3; 0.052 M), 0.1 ml of phenazine methosulphate (186 µM), 0.3 ml of NBT (300 µM) and 0.2 ml of NADH (750 µM). The reaction was started by addition of 0.2 ml of NADH solution (750 µM). After incubation at 30°C for 90 s, the reaction was stopped by addition of 0.1 ml of glacial acetic acid. The reaction mixture was stirred vigorously with 4.0 ml of n-butanol. Colour intensity of the chromogen in the butanol was measured spectrophotometrically at 560 nm. One unit of enzyme activity was defined as that amount of enzyme which caused 50% inhibition of NBT reduction/mg protein. Glutathione peroxidase assay: Liver Glutathione peroxidase (GPx) activity was assayed in a cuvette containing 0.890 ml of 100 mM potassium phosphate buffer (pH 7.0), 1 mM EDTA, 1mM NaN3, 0.2 mM NADPH, 1 U/ml GSH reductase and 1mM GSH. Each liver homogenate (10 µl) was added to make a total volume of 0.9 ml. The reaction was initiated by the addition of 100 µl of 2.5 mM H2O2, and the conversion of NADPH to NADP+ was monitored with a spectrophotometer at 340 nm for 3 min. GPx activity was expressed as nmoles of NADPH oxidized to NADP+/ (min. mg protein), using a molar extinction coefficient of 6.22×106 (cm−1M−1) for NADPH 23. Determination of mRNA level using Real-time PCR: Total RNA was isolated from frozen liver tissues using the TRIzol reagent according to the manufacturer’s protocol (Invitrogen, Carlsbard, CA). The RNA concentration and the quality were determined spectrophotometrically at 260 nm and by the A260/A280 ratio, respectively. Total RNA (4 µg) was reversed transcribed into cDNA with the use of 200 U of M-MuLV reverse transcriptase (Fermentas, Lithuania) and 0.2 µg of random hexamer (Fermentas, Lithuania) as the primer. The amplification reactions were performed on a Roche light cycler instrument (Roche diagnostics GmbH, Mannheim, GER) applying the following thermal cycling conditions: an initial activation step for 3 min at 95°C followed by 45 cycles including a denaturation step for 10 s at 95°C, annealing step for 15 s at 55°C and extension step for 20 s at 72°C. β-actin was used as a normalizer and the fold change in expression of each target mRNA relative to β-actin was calculated based on 2-ΔΔct comparative expression method. The primers and probes used are listed in Table 1 24, 25. TABLE 1: SEQUENCES OF PRIMERS AND PROBES USED FOR REAL-TIME PCR. Immunoblot analyses: Each frozen liver tissue (10–20 mg) was homogenized with 0.2 ml lysis buffer containing 10 mM Tris (pH 7.4), 100 mM NaCl, 1 mM EGTA, 1 mM EDTA, 1 mM NaF, 20 mM sodium pyrophosphate, 2 mM Na3VO4, 1% Triton X–100, 10% glycerol, 1 mM dithiothreitol (DTT), 1 mM phenylmethylsulphonyl fluoride, 10 μg/ml leupeptin, 1 µg/ml pepstatin and 60 µg/ml aprotinin. After 30 min, liver homogenates were centrifuged at 14000 rpm for 15 min at 4°C. Protein concentration of each sample was determined using Lowry’s procedure 20. Equal quantities of protein (50 µg/lane) were separated on a 15% SDS–PAGE and electroblotted to a polyvinylidene difluoride (GE Healthcare Bio–Sciences, Piscataway, NJ, USA) membrane. Membranes were blocked in Tris–buffered saline pH 7.6 containing 0.1% Tween–20, 0.05% sodium azide and 4% non–fat dry milk overnight at 4°C. Blocked blots were incubated with primary antibodies for 2 h at room temperature using diluted antibody in Tris–buffered saline pH 7.6, 0.05% Tween–20 and 1% non–fat dry milk as recommended by the manufacturer. After 1 h incubation at room temperature with anti–rabbit or anti–mouse horseradish peroxidase–conjugated secondary antibodies, the proteins were detected by an enhanced chemiluminescence (ECL) detection system (GE Healthcare Bio–Sciences, Piscataway, NJ, USA) according to the manufacture’s instructions. The specific signal was revealed by autoradiography. All antibodies were obtained from Biosource Inc. (Camiarillo, CA). In all experiments, equal protein loadings have been confirmed by the β–tubulin content. The density of each band was measured by Scion Corporation software (Scion Image for Windows) after background subtraction. Statistical analyses: Data are expressed as mean ± SD of five independent triplicate measurements and statistically analyzed using Student’s t-test. Values of p < 0.05 were considered significant. Food consumption and body weight: To obtain the crude residue, the EtOH extract was concentrated under reduced pressure. The average yield of the given extract was approximately 22%. In order to determine the outcome of plant extract on MCD-fed rats, we monitored the food consumption and body weight of each group throughout the experimental period. Our findings showed that food consumption was not affected with plant extract treatment. Overall, the mean body weight was not significantly changed among different groups (data not shown). The effect of T.polium extract on histopathological lesions: According to Table 2 and Fig. 1A, no evidence for histopathological lesion was observed in the rats’ livers fed control diet. In contrast, feeding MCD diet for 8 weeks caused grade 1 steatosis and infiltration of inflammatory cells in the liver as well as ballooning degeneration of hepatocytes (Fig. 1C). As shown in Figure 1D, treatment with TPC decreased these factors to grade 0 in 100% of the rats. However, drug–related hepatocellular injuries (such as acidophil bodies and confluent necrosis) were clearly evident among extract supplemented groups (Fig. 1B, D). Masson trichrome staining did not confirm the incidence of fibrosis in any of the groups. TABLE 2: HISTOLOGICAL FINDINGS ON LIVERS OF RATS FED CONTROL, C+TPC, MCD AND/OR MCD+TPC DIETS. Each histological variable has been measured according to Kleiner et al scoring. MCD,methionine– choline deficient; TPC, crude extract of T. polium. FIG. 1: Histological analyses of the liver samples of rats fed control, C+TPC, MCD and/or MCD+ TPC diets for 8 weeks. 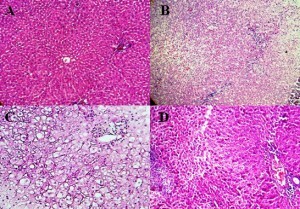 Liver sections were stained with hematoxylin–eosin (HE) and masson trichrome. 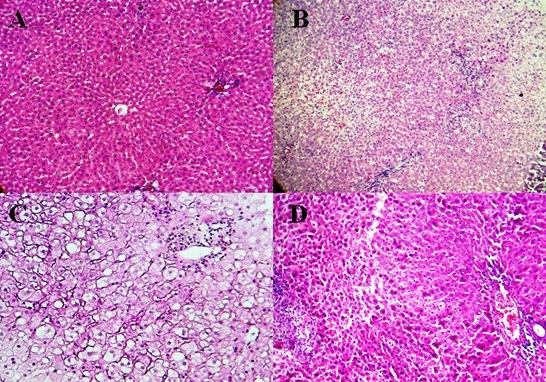 (A) Control group had normal liver (HE ×100), (B) C+TPC group showed drug related liver injuries (HE ×100), (C) MCD group showed micro– and macro–vesicular steatosis, ballooning degeneration and lobular inflammation around central vein (HE ×400) and (D) MCD+TPC group had no evidence of histological lesions of NASH, but drug related–liver injury was found (HE ×100). The effect of T. polium extract on sera lipid profiles and hepatic enzymes: The effects of oral administration of the crude extract on rats’ sera lipid profiles are summarized in Table 3. Keeping the rats on a MCD diet significantly decreased the TG and VLDL levels in sera of MCD group as compared to control group. However, the sera levels of TG and VLDL significantly increased in TPC-treated MCD fed rats by 27% and 26%, respectively. Based on Table 3, the plasma levels of ALT and AST significantly increased (110% and 61%, respectively) among the MCD group compared to the control group. (p<0.05). However, treatment with TPC markedly reduced the activity levels of ALT and AST by 44% and 45%, respectively, compared to TPC–untreated MCD–fed rats. TABLE 3: CHANGES IN THE SERA LIPIDS AND THE HEPATIC ENZYME LEVELS IN RATS FED CONTROL, C+TPC, MCD AND/OR MCD+TPC DIETS. Data represent means ± SD (n=5). * Significantly different from control group (p<0.05). ** Significantly different from MCD group (p<0.05). The effect of T. polium extract on hepatic oxidative status: Oxidative stress is considered as a central mechanism of liver injuries in NASH 1,2. In that line, we evaluated the effect of TPC on the liver antioxidant status along with lipid peroxidation. The liver MDA level, an accepted end–product and marker of oxidative stress–induced lipid peroxidation 26, among MCD groups was 1.65 fold higher than the MDA level among the control healthy rats. However, treatment of MCD group with TPC significantly reduced MDA level by 21% relative to TPC– untreated MCD–fed rats (Figure 2A). Fig. 2: Evaluation of hepatic oxidative status in liver homogenates of rats fed control, C+TPC, MCD or MCD + TPC diets. (A) Hepatic levels of MDA and GSH (B) Hepatic levels of SOD and GPx. Values are mean ± SD of five independent triplicate measurements. *significantly different from control group (p<0.05). ** Significantly different from MCD group (p<0.05). As shown in Figure 2A, The MCD diet has caused a severe decrease in hepatic GSH content relative to control group. However, administration of TPC increased the GSH level by 52%, compared to MCD group. Figure 2B shows that the activities of hepatic antioxidant enzymes such as SOD and GPx have significantly decreased after 8 weeks of MCD diet administration, relative to control group. 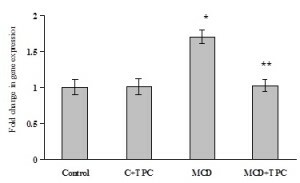 However, treatment of MCD fed rats with TPC caused a significant increase, relative to MCD group, in SOD, GPx and activities by almost 50% and 75%, respectively. The effect of T. polium extract on hepatic TNF-α level: As shown in Fig. 3, based on real time-PCR evaluations, in MCD group the TNF-α mRNA levels were increased by 1.7 fold compared to normal healthy rats. Treatment with TPC significantly decreased the TNF-α mRNA levels by 40% relative to rats of MCD group. Fig. 3: TNF-α expression in rats fed control, C+TPC, MCD and/or MCD+ TPC diets. The relative mRNA expression of TNF-α was measured using real-time PCR after normalizing the cycle thresholds (Ct) of each sample against their corresponding β-actin. Data represent means ± SD (n=4). * Significantly different from control group (p<0.05). ** Significantly different from MCD group (p<0.05). The effect of T.polium extract on caspase–3 cleavage: The conversion of procaspase–3 to active caspase-3 and enhanced hepatocyte apoptosis is well documented among both human and experimental animal model of NASH 27, 28. Our results also indicated elevation of liver caspase-3 level among the MCD–fed rats relative to the control diet–fed rats (Fig. 4A). However, treatment with TPC attenuated the MCD–induced activation of caspase-3 by 1.7-fold, as shown in Fig. 4A and C.
The effect of T. polium extract on Akt and JNK phosphorylation status: Recent studies have indicated that ROS are capable of inducing cellular injuries and death through indirect actions on not-well characterized signaling pathways. In this study, the elevated oxidative stress was associated with a significant reduction (3.3-fold) in the extent of Akt phosphorylation among the MCD–fed rats relative to normal healthy rats (Fig. 4B, D). Despite this observation, the phosphorylated form of JNK was increased by 1.6-fold among MCD group relative to control group. Treatment with TPC enhanced the extent of Akt phosphorylation by 1.7-fold and reduced the level of JNK phosphorylation relative to the respective control rats (Fig. 4B, D). In addition, as it is evident from Figure 4B, no alterations in total hepatic Akt and JNK contents have occurred among different rat groups. FIG. 4: Representative western blot pattern analyses of the rats’ livers fed control, MCD and/or the MCD+TPC diets for at least 8 weeks. (A) Effect of T.polium on procaspase–3 activation in hepatocyte. 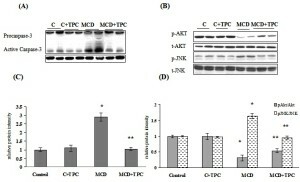 (C) Effect of T. polium on hepatic Akt and JNK phosphorylation status. The densitometry analyses of each gel document are presented in B and D in which the data are the means ± SD (n=4). DISCUSSION: Feeding diet devoid of methionine and choline to rats serves as an established approach for induction of steatohepatitis 29. It has been shown that MCD-diet feeding leads to inhibition of VLDL synthesis along with depletion of hepatic antioxidant capacity1,29. Thereby, the accumulated lipids tend to be oxidized by the elevated levels of ROS leading to oxidative damages. In the present study, the prepared MCD diet markedly decreased the sera levels of VLDL and triglycerides among the rats with induced steatosis. In addition, significant hepatic depletion of both enzymatic and non-enzymatic antioxidants along with pronounced increase in sera ALT, AST, hepatic TNF-α and MDA levels were documented. Although the exact mechanisms that mediate transition from steatosis to NASH remain unknown, oxidative stress and proinflammatory cytokine-mediated injuries are believed to play key roles in NASH pathogenesis1,2,4. polium is a plant with established high antioxidant and anti-inflammatory activities11-13. Phytochemical investigation of T.polium crude extract has demonstrated the presence of flavonoids17. Many of biological actions of flavonoids have been attributed to their powerful antioxidant properties. The isolation and structural elucidation of flavonoids from T.polium together with their antioxidant and free radical scavenging activities has recently been published15,17. Endogenous antioxidants have the capability to prevent the uncontrolled formation of free radicals and reactive oxygen species, and/or to inhibit their reaction with biological molecules. These antioxidants include mainly enzymes such as SOD and GPx and non-enzymatic antioxidant such as GSH26. Videla and co-workers have shown that the level of these oxidative stress-related parameters decreased in the liver of patient with NASH30. Deficiency in the antioxidant defense system usually results in ineffective scavenging of free radicals and this may lead to disruption of cellular function and oxidative damages to membranes through lipid peroxidation26. A number of studies have indicated that antioxidants such as vitamin E and C, the plant-derived flavonoids and isoflavonoids can prevent or attenuate the extent of oxidative stress among various NASH experimental models mainly through scavenging the reactive oxygen species18,30,31. In this study, the depletion of hepatic antioxidants by MCD diet was associated with high level of lipid peroxidation, as it was evident by the higher than normal level of MDA in the liver homogenates. However, administration of the crude extract significantly increased hepatic GSH content and the level of GPx and SOD enzyme activities and decreased the MDA level relative to MCD group. Tumor necrosis factor-α has been known as a major cytokine involved in the development and progress of steatosis to NASH. This cytokine plays pivotal roles in apoptosis, insulin resistance, mitochondrial dysfunction and fibrosis throughout NASH development stages 1,3,4. It has been reported that the plasma TNF-α level and the hepatic TNF-α mRNA content had increased in patients with NASH 32. This increase might be due to oxidative stress-activated nuclear factor-kB (NF-kB), which induces the expression of TNF-α 1, 3. Our results also demonstrated that the crude extract of T. polium prevented the MCD-diet induced elevation of TNF-α and resulted in a significant decrease in hepatic TNF-α expression. Emerging data suggest that a strong correlation exists between the severity of oxidative stress and the extent of apoptosis among NASH–affected hepatocytes3,27,28. Activation of caspases, mainly procaspase–3, has been documented among the hepatocytes undergoing apoptosis27. Our data also supported the elevation of caspase–3 level among the liver cells of the NASH–affected rats relative to normal healthy rats. However, treatments of NASH–affected rats with TPC significantly decreased caspase–3 level as well as the MDA level. This observation might be due to attenuation of oxidative stress by the plant extract through scavenging of free radicals27,13. The protein kinase Akt is activated in response to a wide spectrum of stimuli including ROS and TNF-α and this activation results in enhanced resistance to apoptosis through multiple mechanisms7. Reduced Akt phosphorylation has been reported among cultured hepatocytes overexpressing CYP2E and also among experimental models of NASH 8,9. It has been reported that Akt phosphorylates and inactivates caspase-9, an initiator and effector of apoptosis. Subsequently, caspase-3, a downstream executioner caspase of caspase-9, is unable to be cleaved and this leads to inactivation of caspase-3 with subsequent cell survival 7. Furthermore, the role of oxidative stress in JNK activation and development of NASH has been reported by several independent research groups 5. ROS activation of JNK leads to activation of mitochondrial cell death machinery. JNK has been reported to catalyze the activation of Bcl-2 family members. For example, JNK activation is able to either upregulate proapoptotic (e.g. Bax) or inhibit antiapoptotic (e.g. Bcl-2 or Bcl-xl) proteins, leading to an imbalance between the Bcl-2 family members. The JNK-induced phosphorylation of Bcl-2 appears to suppress the prosurvival function of Bcl-2 proteins 6. Parallel to the literature data, our results clearly demonstrated that the MCD diet-induced apoptosis is associated with Akt inactivation and JNK activation. Moreover, our data revealed that TPC significantly ameliorated oxidative stress among MCD diet–fed rats and reduced the high level of apoptosis. Furthermore, the extract dramatically caused activation of Akt (by phosphorylation) and deactivation of JNK (by dephosphorylation). Similarly, recent studies have shown that ROS suppressors have reduced apoptosis, increased Akt activation and decreased JNK phosphorylation 33. Having in mind the strong antioxidant activity of the T. polium extract, it is speculated that the hepatocyte protective effect of T. polium extract against MCD-induced NASH is mediated through inhibition of ROS generation and free radical scavenging. This speculation, however, do not exclude the possibilities of other mechanisms. Our present investigation also revealed that the beneficial effects of T. polium extract on the histopathological features of NASH were associated with some degree of hepatic side effects such as confluent necrosis and accumulation of acidophil bodies. Couples of clinical and pharmacological studies have also shown that TPC has adverse effects on liver and kidney functions 34. CONCLUSION: Our findings clearly revealed that the hepatoprotective effect of T.polium among MCD–induced NASH is mediated mainly through suppression of ROS level with consequent activation of Akt and deactivation of JNK. The present data certainly support the potential use of responsive constituents of T.polium for NASH and/or other liver diseases treatments. In that regard, further molecular investigations are certainly demanded. ACKNOWLEDGMENTS: The authors thank the Research Council of University of Tehran for the financial support of this investigation. Marra F, Gastaldelli A, Baroni GS, Tell G, Tiribelli C: Molecular basis and mechanisms of progression of non–alcoholic steatohepatitis. Trends Mol Med 2007;14:272-81. Day CP, James OF: Steatohepatitis: a tale of two “hits”: Gastroenterology 1998;114:842–845. Tilg H, Diehl AM: Cytokines in alcoholic and nonalcoholic steatohepatitis. N Engl J Med2000;343:1467-1476. Copaci I, Micu L, Voiculescu M: The role of cytokines in non-alcoholic steatohepatitis. A systematic review. J Gastrointestin Liver Dis2006;15:363-373. Schattenberg JM, Singh R, Wang Y, Lefkowitch JH, Rigoli RM, Scherer PE, Czaja MJ: Jnk1 but not jnk2 promotes the development of steatohepatitis in mice. Hepatology 2006;43:163-172.
dependent and independent pathways. Genes Cells2001;6:519-530. Kennedy SG, Wagner AJ, Conzen SD, Jordán J, Bellacosa A, Tsichlis PN, Hay N: The PI 3-kinase/Akt signaling pathway delivers an anti-apoptotic signal. Genes Dev1997; 11:701-713. Valenti L, Rametta R, Dongiovanni P, Maggioni M, Fracanzani AL, Zappa M, Lattuada E, Roviaro G, Fargion S: Increased expression and activity of the transcription factor FOXO1 in nonalcoholic steatohepatitis. Diabetes2008; 57:1355-1362. Schattenberg JM, Wang Y, Singh R, Rigoli RM, Czaja MJ: Hepatocyte CYP2E1 overexpression and steatohepatitis lead to impaired hepatic insulin signaling. J Biol Chem 2005; 280:9887-994. Bugianesi E, Marzocchi R, Villanova N, Marchesini G: Non–alcoholic fatty liver/non–alcoholic steatohepatitis (NAFLD/NASH): treatment. Best Pract Res Clin Gastroenterol 2004; 18: 1105-1116. Tariq M, Ageel AM, al–Yahya MA, Mossa JS, al–Said MS: Anti–inflammatory activity of Teucrium polium. Int J Tissue React 1989;11:185–188. Esmaeili MA, Yazdanparast R: Hypoglycemic effect of Tecurium Polium: studies with rat pancreatic islets. 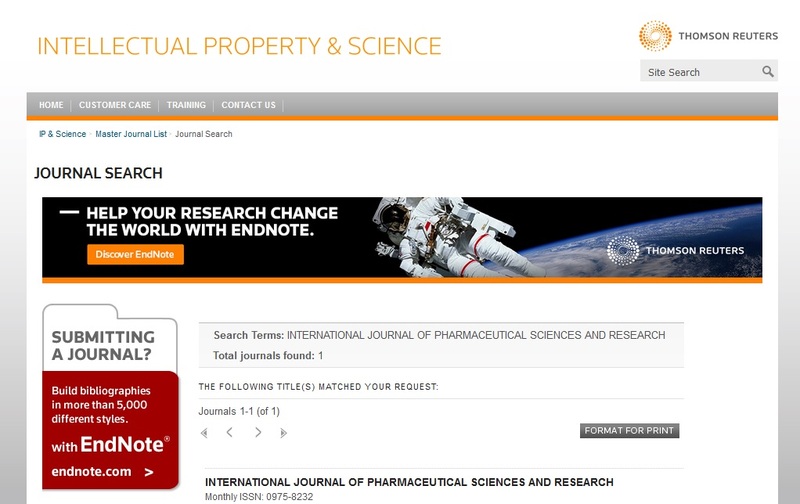 J Ethnopharmacol 2004;95:27–30. Yazdanparast R, Ardestani A: Suppressive effect of ethyl acetate of Teucrium polium oncellular oxidative stress damages and apoptosis induced by 2–deoxy–D– ribose: Role of denovo synthesis of glutathione. Food Chem 2009;114:1222-1230. Ardestani A, Yazdanparast R, Jamshidi Sh: Therapeutic effects of Teucrium polium extract on oxidative stress in pancreas of streptozotocin-induced diabetic rats. J Med Food2008;11:525-532.
peroxidation in rat liver microsomes. Fresenius Environ Bull 2005;14:957–959. Rizk AM, Hammouda FM, Rimpler H, Kamel A: Iridoids and Flavonoids of Teucrium polium Herb. Planta Med 1986; 52:87-88. Ustundag B, Bahcecioglu IH, Sahin K,Duzgun S, Koca S, Gulcu F, Ozercan IH: Protective effects of soy isoflavones and activity levels of plasma paraoxonase and arylesterase in the experimental nonalcoholic steatohepatitis model. Dig Dis Sci 2007; 52: 2006-2014.
and validation of a histological scoring system for nonalcoholic fatty liver disease.Hepatology2005;41:1313-1321. Lowry OH, Rosebrough NJ, Farr AL, Randall RJ: Protein measurement with the Folinphenol reagent. J Biol Chem 1951;193:265–275. Draper HH, Hadley M: Malondialdehyde determination as index of lipid peroxidation. MethEnzymol 1990;186: 421-431. Kakkar P, Das B, Viswanathan PN: A modified spectrophotometric assay of superoxidedismutase. Indian Journal of Biochemistry and Biophysic 1984;21: 130-132. Paglia DE, Valentine WN: Studies on the quantitative and qualitative characterization of erythrocyte glutathione peroxidase. J Lab Clin Med 1967; 70: 158-159. Rioja I, Clayton CL, Graham SJ, Life PF, Dickson MC: Gene expression profiles in the rat streptococcal cell wall-induced arthritis model identified using microarray analysis. Arthritis Res Ther 2005; 7:R101-117. Gold EJ, Monaghan MA, Fleming JS: Rat activin-βE mRNA expression during development and in acute and chronic liver injury. J Mol Genet Med 2006; 2:93-100.
de Zwart LL, Meerman JH, Commandeur JN, Vermeulen NP: Biomarkers of free radical damage applications in experimental animals and in humans. Free Radic Biol Med 1999; 26: 202-226. Singh R, Czaja MJ: Regulation of hepatocyte apoptosis by oxidative stress. J Gastroenterol Hepatol2007; 22:S45-48. Feldstein AE, Canbay A, Angulo P, Taniai M, Burgart LJ, Lindor KD, Gores GJ: Hepatocyte apoptosis and Fas expression are prominent features of human nonalcoholic steatohepatitis. Gastroenterology2003; 125:437-443. Koteish A, Mae Diehl A: Animal models of steatohepatitis. Best Pract Res Clin Gastroenterol 2002; 16:679-690. Videla LA, Rodrigo R, Orellana M, Fernandez V, Tapia G, Quiñones L, Varela N, Contreras J, Lazarte R, Csendes A, Rojas J, Maluenda F, Burdiles P, Diaz JC, Smok G, Thielemann L, Poniachik J: Oxidative stress-related parameters in the liver of non-alcoholic fatty liver disease patients. Clin Sci (Lond) 2004; 106:261-268. Oliveira CP, Gayotto LC, Tatai C, Della Nina BI, Lima ES, Abdalla DS, Lopasso FP, Laurindo FR, Carrilho FJ: Vitamin C and vitamin E in prevention ofnonalcoholic fatty liver disease (NAFLD) in choline deficient fed rats. Nutr J 2003; 2: 9-11. Crespo J, Cayón A, Fernández-Gil P, Hernández-Guerra M, Mayorga M, Domínguez-Díez A, Fernández-Escalante JC, Pons-Romero F: Gene expression of tumor necrosis factor alpha and TNF-receptors, 55 and 75, in nonalcoholic steatohepatitis patients. Hepatology 2001; 34:1158-1163. Kaneto H, Nakatani Y, Miyatsuka T, Kawamori D, Matsuoka TA, Matsuhisa M, Kajimoto Y, Ichijo H, Yamasaki Y, Hori M: Possible novel therapy for diabetes with cell–permeable JNK–inhibitory peptide. Nat Med 2004;10: 1128-1132. Mazokopakis E, Lazaridou M, Tzardi J, Mixaki J, Diamantis I, Ganotakis E: Acute cholestatic hepatitis caused by Teucrium polium L. Phytomedicine 2004; 11: 83-84. Nosrati N, Aghazadeh S, Yazdanparast R: Effects of Teucrium polium on insulin resistance in nonalcoholic steatohepatitis. J Acupunct Meridian Stud 2010; 3:104-110. Aghazadeh S and Yazdanparast R: Suppressive effect of Teucrium polium on oxidative damages among experimental Steatohepatitis. Int J Pharm Sci Res 2013; 4(5); 1747-1756.